It's difficult to play Mornington Crescent here with any certainty because there are so many versions of the game. Admittedly, they all have the same basic idea, but really, we'd need to know exactly which set of rules we're meant to use. A connection between the dangers of thread on Planet Pern, and threads on twitter. That's funny, after I spent a little while puzzling over it. I have very cheerful memories of reading these books, quiet a long time ago. I'd be interested if anyone would elaborate on the ice-skate problem. Why did physicists once think they knew how they worked? And why don't they think that any more? One swift visit to explainxkcd.com later, I'd say this is a good comic. I've moved houses quite often. I've never labelled a box. Is it a normal thing to do? Do most people do it? Good explanation! It did give me at least some notion of what it's all about, and I'd have said that was an almost impossible task. 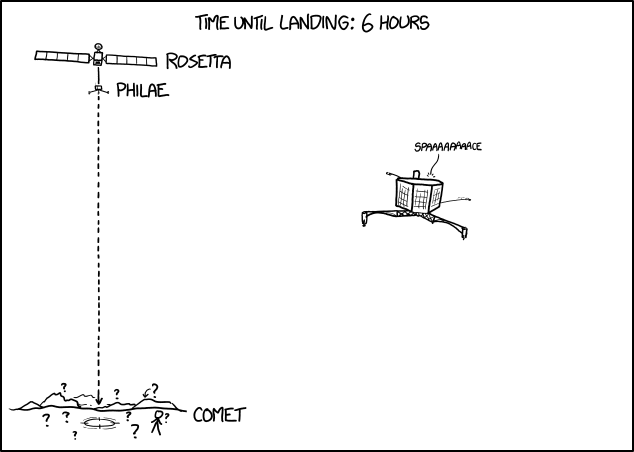 XKCD seems continually amazed that time passes. 'Can you believe it's been X years since Y?' 'Can you believe there are people who were't born when Z happened?' Yes, I can. None of these things make me feel old. Topic: 1555: "Exoplanet Names 2"
Re: 1555: "Exoplanet Names 2"
They might fall foul of 'unsporting conduct' or something similar in the rulebook. I'd say it definitely would be unsporting conduct to kill and eat your opponent's dog, I just don't think the referee would allow it. Would be a yellow card at least, maybe red. I felt so cheerful when I heard this on the news! 'You've just bricked something important.' I don't understand that. What does 'bricked' mean in this context? Might these large dinosaurs have had such small, primitive feathers that they looked like reptiles anyway? In the same sort of way that humans are covered in hair, but you can't really see most of it? It reminds me of portraying ancient Greek and Roman statues as pristine white marble, when really they were brightly painted. Actually, if I were making a film, I might do that. White marble does seem cooler, somehow. Asking 'Who is the world's best guitarist?' I have the answer 'Mount Fuji, poodle.' So - a Japanese musician, hair-metal enthusiast perhaps? And after that, whatever Apple were using. It's a good plan and I support it. Though when it's time to descend, I wonder if it might be better for the airborne squirrell to just gnaw through the string attaching it to the balloon, rather than shooting the balloon? That would save on weight, wouldn't have to carry a gun or a bow and arrow. Aiwendil wrote: Edit: A more pedagogical link for Feynman diagrams (haven't really read through it yet, but it looks rather friendly): Let's draw Feynman diagrams! Thanks for that link, I found it really interesting. Now at least I have some idea what these Feynman diagrams mean. The internet shutting down would be doing the wavy-haired woman a huge favour. If she's been saving her money to fly someone over, and support them, she's being taken for a fool. It would inevitably end in disaster. 'Spaaaaaaaace' The Philae lander is quoting Portal 2! It's probably been waiting a long time for a chance to do that. I like geese. In Scotland they guard whisky warehouses. The line connecting the dialogue to the picture of the Earth doesn't seem to be pointing at Houston in Texas. Maybe the astronaut has dialled the wrong number and he's just talking to some random person called Houston. When people use 'touché' in conversation, it usually refers to a rejoinder, something like 'OK, you got me back with that one.' Does it have that meaning in fencing? Or can a 'first strike' be called as touché? Sauron gave seven rings of power to the dwarves. Looking at that picture, I think Guacamole might have one.